Name brand quality, S&S price! Save money on all of your craft projects. Our own special high-quality craft formula. Great adhesion to paper, wood, leather and fabric. Dries clear and washable, too! Our own special high-quality craft formula. All-purpose glue adheres perfectly to paper, wood, leather and fabric. Dries clear, and it's washable! Non-toxic. Conforms to ASTMD-4236. 4 oz. Pack of 12. We recommend using our Clear Color Splash® Glue (GL583 or GL584) for making slime! Went to use this glue for a project for the kiddos at our resort and glue run all over while trying to use the bottle. The glue is not at all Elmers. Merchant response: Thank you for the recent product review. Your comment has been sent to the product team. Love the small bottle size much easier for our young campers to use! I am in charge of arts crafts for a Reading Camp in Buffalo NY every summer for two weeks. I have to order and ship all of my supplies up there. I need to have quality products at a good price. This glue fits the bill and has for many years. 1st Graders and up can easily handle the small bottles. 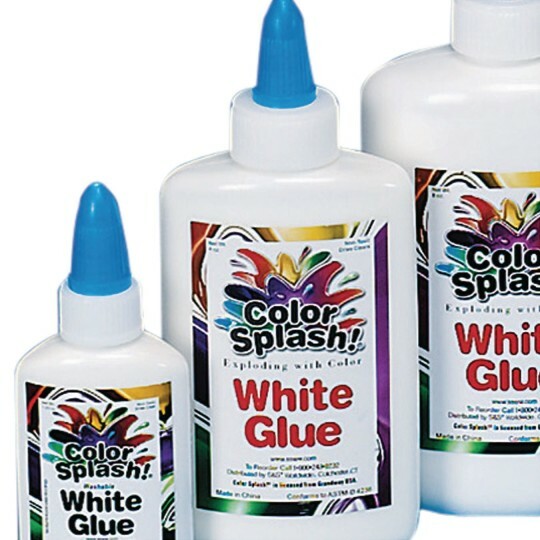 Color Splash!® White Glue, 8 oz.